If you’re part of the corporate world, this outfit is for you! Who says you can’t add color to your office uniform? Don’t let the office grinch stop you. I’m wearing color from head to toe! 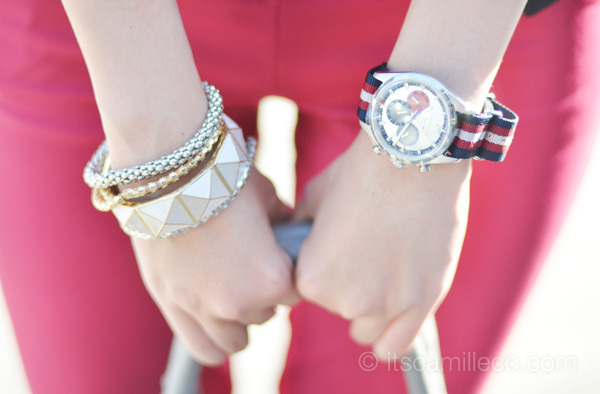 Even my watch is colorful! Doesn’t it look so sporty vintage? It’s called the Long Island watch in 40mm from Oxygen Paris’ Sport Dual Time collection. Just FYI, Oxygen Paris is not the same as Oxygen clothing. 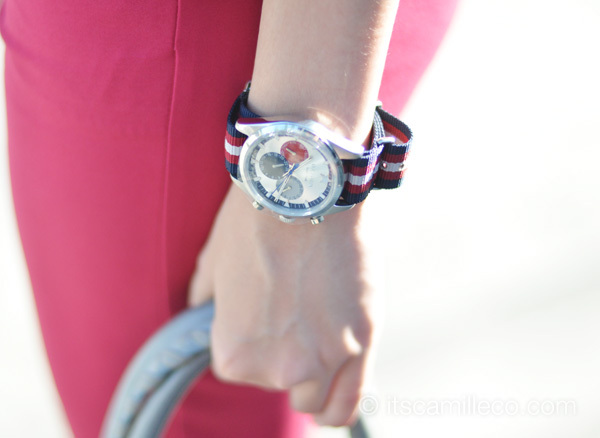 It’s a French brand that sells hip, young and colorful watches that come with interchangeable straps. I find it quite clever actually. You get to have different watches for the price of 1! If you get tired of one strap, there are 42 others to choose from! Of course, you can opt to buy just the watch with one strap but if I were you, I’d take advantage of their +1 strap or +2 straps bundle prices! Oxygen watches are available at Rustans Shangri-la and Time Depot stores in Mall of Asia, Robinsons Manila and Festival Mall Alabang. You can visit Oxygen Paris’ Facebook page here. Can I just say, these shoes are so comfortable!!! I actually have these in another color as well but these are my favorite because the colors just pop! Traffic Stopper!! haha, Talagang sa gitna ng kalsada nag shoot. Tricia… Gosingtian? I fawn over her fashion editorial shoots. And yes, just because one works in an office environment, one does not have to fore go being fashionable and be dull and drabby. Something my former office mates seem to need to understand. Hahaha this street isn’t as busy as Ayala Ave though! Because we are 3 girls in the family :) We get to share! The perfect corporate outfit that does not sacrifice style and comfort. I will certainly try on these pieces in the next days. I didn’t know pink and blue would look good together. Go for it! :) Thanks Rosey! So colorful again! :) love it! Omg camille. another fave look! With that, I will try to wear pink slacks tomorrow in the office with matching yellow top.. Love love love!! I noticed! :) Welcome back! i love the colors in your outfit and the effects of the photo, perfect! the colors are amazing! i love your style! yehey! corporate outfits! love it! how about tokongs or ung 3/4 pants for a semi-formal day but still hip? i am really outta ideas on wat to wear! sorry that i cant put it into words. haha. Wow! And yet another inspiration for my office outfit! THanks Camille! Thanks so much Chai!I can always count on you! I really, really, really LOVE that bag. It’s so pretty! It’s one of my dream bags! May i know how much is your watch? Please? You’re making me blush haha! I don’t know what to answer! love your outfit! you look good in those colors! :) btw, is that a Balenciaga city? ba’t parang square? or is it just me? hehe. I want to try that in office! Nice! Is Ms. Tricia Gosingtian the one took these? Yes she so graciously did :) even if the it was so hot that day! Absolutely chic and stunning!Love the bag!Gorgeous! Great outfit and these photos are so pretty! i wonder how tall are u??? HEHE the color combination is sooooo cute!!! =))) Love it! I always thought we are forbidden to wear colored corporate attire. In school, we are told to wear a black blazer and all that. At least some teachers tell us, but I have one professor who said “since fashion is changing, there’s an exception”. =))) The business world will be so boring if we’re only allowed black coats, bottoms, and shoes and white tops. I love that atmosphere of photos and pastel colors! and the colour match you well! Thanks Wulan! You’re always the sweetest! Didn’t you cause traffic with this look? haha! but you are still a head-turner, dear. Great, great!! Haha no not at all! :) Just weird stares haha! I like this, definitely a ray of sunshine amidst gloomy grays and blacks in the office…. I always look out for this kind of outfits because it’s so relatable. You always use such great colors and FAB accessories! LOVE your jewelry & purse! 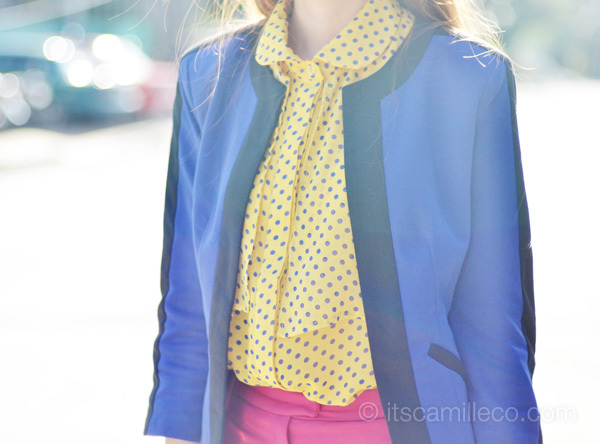 love the colorful outfit! they all go well together! Love the photos and the colors of your outfit!